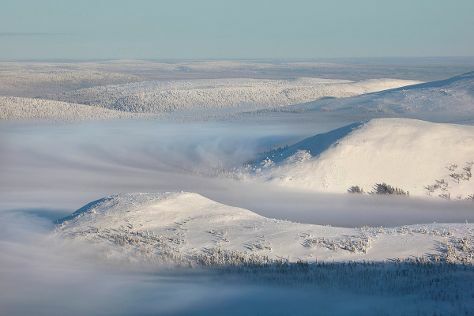 Step off the beaten path and head to Pallas-Yllastunturi National Park and Yllas Ski Resort. On the 27th (Tue), ski the day away in the pristine settings at Levi Ski Resort. There's lots more to do: shop like a local with Elan Ski Shop & Rental, relax in the rural setting at Santa"s Cottage & Pet Farm, and admire all the interesting features of Ice Karting Levi. To find more things to do, where to stay, photos, and other tourist information, refer to the Levi trip builder site . San Francisco, USA to Levi is an approximately 23.5-hour flight. The time zone difference when traveling from San Francisco to Levi is 10 hours. In November, Levi is much colder than San Francisco - with highs of 26°F and lows of 15°F. Finish your sightseeing early on the 27th (Tue) so you can drive to Rovaniemi. You'll explore the less-touristy side of things at Ounasvaaran Hiihtokeskus Oy and Rovaniemi City Library. And it doesn't end there: get in on the family fun at Santa Claus Village, look for gifts at Your Piece Of Finland, take an in-depth tour of Arktikum, and have fun at Santa Claus Office. For reviews, where to stay, traveler tips, and tourist information, you can read our Rovaniemi vacation builder tool . Drive from Levi to Rovaniemi in 2.5 hours. Alternatively, you can take a bus. In November, plan for daily highs up to 28°F, and evening lows to 20°F. Finish your sightseeing early on the 30th (Fri) so you can travel back home.